The triglyceride composition of pine oil was investigated by reversed-phase HPLC. 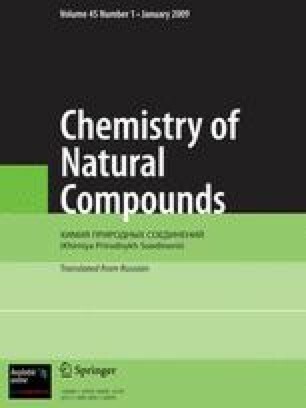 The fatty-acid composition of the oil was calculated (mol %): 18:3, 17.1 ± 2.0; 18:2, 49.0 ± 2.3; 18:1, 23.8 ± 2.1; 18:0, 2.5 ± 0.1; 16:0, 6.3 ± 2.2. The retention times of the triglycerides containing octadecatrienoic acid were consistent with the 18:3(5,9,12) structure.